100% online GAMSAT practice test with instant access. 53 multiple choice sample questions, instant scores. Section 1 and Section 3 worked solutions for FREE. All sample questions simulate the real exam. Worked solutions for all practice questions in Section 3. By the author of the Gold Standard GAMSAT book - Dr. Ferdinand. Please obtain e-book or booklet access to the ACER questions in order to maximize your learning experience. All I can say is thank you Gold Standard and Dr Ferdinand! From the comprehensive text book, to the online tests, videos and forum Gold Standard played a huge part in my 74 GAMSAT 2011 score. I advise any GAMSAT candidates to make use of the invaluable service that is Gold Standard. Thanks again. Last year around this time, I completed the GAMSAT Prep course in Perth and realized the other day that Dr. Ferdinand said he'd be interested to see how everyone went after all the preparation we did. I received 71 overall in the GAMSAT, with a score of 77 in the science section, which is what the course focused on, and I've been accepted to study Medicine at UWA this year. Thought he may appreciate the feedback, as I know completing the course certainly contributed to my success. The [Gold Standard] GAMSAT Prep package is an invaluable studying tool because it allows for an efficient preparation and enables me to apply his strategies to its fullest extent. I would like to say thank-you to Dr. Ferdinand and everyone at the Gold Standard GAMSAT-prep for providing an excellent course that enabled me to prepare for this year's GAMSAT exam. 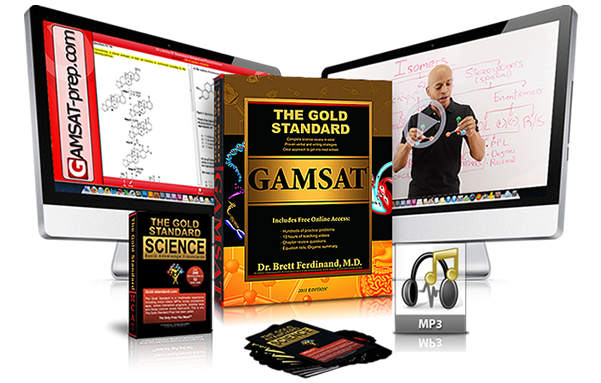 As a part of my preparation for the GAMSAT, I completed the Gold Standard GAMSAT Preparation Home Study Course. I also attended both of the live GAMSAT courses (i.e. Science Review and Practice GAMSAT Exam) that Dr. Ferdinand conducted in Brisbane. The combination of the Gold Standard textbook, science videos and practice tests provided a comprehensive review of the science concepts that are examined in Section 3. The theory explanations in the Physics videos, the online practice questions and all of the practice exams were especially helpful because I have not studied Physics before. In addition, the review of Physics questions by Dr. Ferdinand in both of the live courses was clear and targeted to the material examined on the real GAMSAT exam. Thank you Dr. Ferdinand! At the live courses, Dr. Ferdinand asked us to let him know how we went in the exam so I just wanted to share my results with you. I received an overall GAMSAT score of 72 with individual scores of 73, 68 and 74 in sections 1, 2 and 3, respectively. I feel that the preparation provided by the Gold Standard course has enabled me to achieve this score. I cannot thank Dr. Ferdinand (and everyone at GAMSAT-prep) enough for providing a course that really delivers! This is more than an answer book! I know - you look at the GAMSAT questions online and freak out... I did, everyone I know did too! However, after reading into this book for around 20 minutes I suddenly got my med-school mojo back. This book motivates and reinvigorates from page one by understanding the vast array of emotions the graduate applicant to medical school will experience. Not only will you learn the fundamental of sciences and social sciences needed to negotiate the exam, but you will realise that becoming a doctor is not just a career change, it's a lifestyle change! Read novels critically, consider all sides to an argument from local council disputes to Governmental debate, put all that we do into a social context (politics) and a nation-wide / global context (Politics) and understand the physical science that make up our world. If that isn't all, the book also includes sane advice on medical school interviews - no mention of fairytale scenarios that you may hear from contemporaries - just cool collected experienced advice. More importantly, it explains that if you remain cool and approach the exam logically and DON'T PANIC, you will probably do well. Make use of the 10 hours free online help and you will ease into this exam with no worries. I have not sat the exam yet but I am already thankful for the feeling of excitement and anticipation of studying medicine once again. Great book, but you need DVD's with it, because some info is too detailed. I would also recommend to do the courses: science review and practice test with review on www.gamsat-prep.com Its well worth it. I used this to prepare for my GAMSAT and found it really helpful. I started studying at the beginning of a 3 month summer break an was a bit dismayed to find that this book recommended at least 6 months! However I come from a science background and in the end managed to fit it comfortably into the 3 months. This kit was indispensable. The book guides you through your revision, it outlines the different sections of the exam clearly with plenty of examples. The essay section was particularly helpful. The essays have to be written in a very small amount of time and so his guide to structuring to include all that was needed whilst demonstrating strong grammar, spelling and well constructed arguments meant that I only wrote 1 side of A4 for each question and yet still received a really high mark for the essay section. The DVDs were also really helpful. The guy presenting them, Dr. Brett, is like the really cool science teacher who you never had but always wish you had. He has a really soothing voice and amicable manner so even on those days when I really didn't feel like studying, he still made me learn things. The flash cards were also really useful, I'd take them to work, on the journeys, use them with dinner. Really useful way to check your learning. I got a good enough score to get me 3 interviews and I am now starting med school at my first choice in September. This kit made a really challenging exam a lot less painless and I'd really recommend it if you're taking on the GAMSAT.